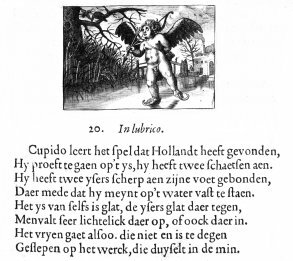 At the beginning of the Golden Age, around 1600, beautifully illustrated books on the topic of love appeared on the Dutch book market. These books are called emblem books: provocative texts and intriguing images that educated young readers in the subjects of love, such as choosing one's partner, marital fidelity and the possible pangs of love. The adjoining image is an example of such a love emblem. Prominently present on the picture is Cupid, the god of love.